We knew that the economy in Oregon was growing at full-throttle rates, which combined with job polarization meant that many high-wage jobs were being created. Particularly in the nation’s largest metropolitan areas, like Portland, that are faring the best overall. 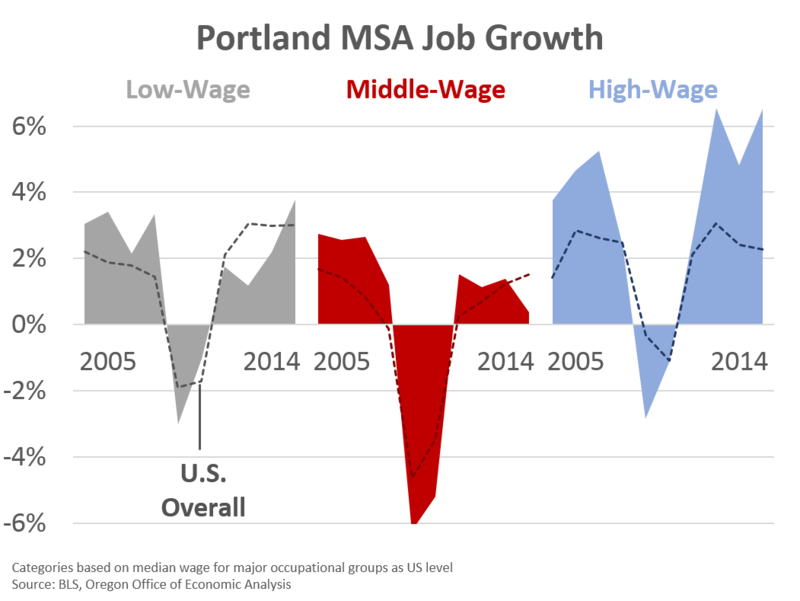 In fact, so far in recovery high-wage jobs in Portland are growing at 5%+ annually. This meant there were more workers, and therefore households, out there with higher incomes, however measuring this is harder in real time given data limitations. 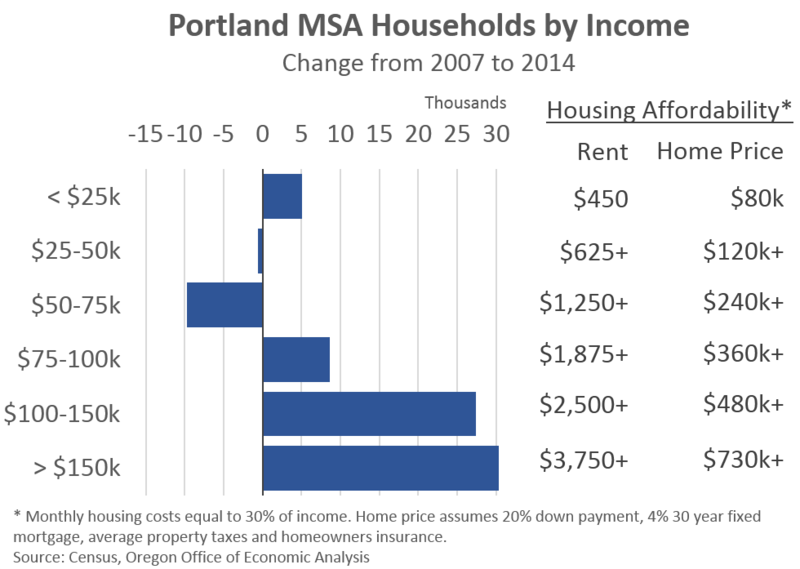 The just released 2014 ACS data shows that, on net, nearly all of the household growth in Portland is in the higher income brackets, relative to 2007. Former colleague and current City of Portland economist, Josh Harwood, found similar patterns across some other big cities. I chose 2007 as the comparison point given that is the last time the region saw these same home prices. So we’re comparing housing peak to housing peak time periods, at least so far. Clearly such households can afford the high rents and home prices. Furthermore, given these trends, on one level it makes sense that new construction is largely going to meet this higher end demand. Not only is the cost of production relatively high (land and labor), credit availability is still restricted for both developers and buyers. Right now there seems to be lots of low volume, high margin building, particularly on the ownership side. Even so, it has still been disappointing from a big picture economic perspective that building has not been more evenly distributed across the income spectrum. Even if the number of households among the lower and middle income brackets is relatively unchanged in this snapshot, it still represents the bulk of the population which has struggled with rising rents and no real income gains. One more thing. Not all of these more numerous higher income households are migrants, or Californians. Some certainly are, but there is considerable movement across these income groups during the past decade. In my own experience, I have been in 3 of the different groups and actually represent a net loss of one household as I got married (two single households turn into one). To help show such movements, below is a GIF of these changes. Notice how during the recession and immediate aftermath, the number of lower income households increased considerably (it was a recession, duh). There is lots more of housing related items I am working on, from affordability to demographics to renting and its influences. I will be a part of both Multifamily NW’s apartment report breakfast (Oct. 14th) and the Home Builders Association of Metropolitan Portland’s 2016 housing forecast (Nov. 6th).